Oh man do these meatballs remind me of dinners at Grandma Clark’s! Good memories!! 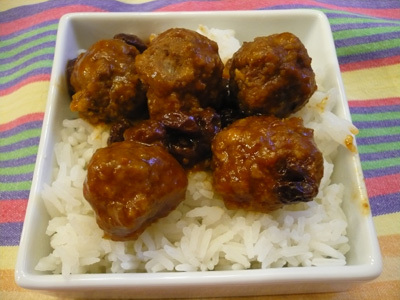 I call these meatballs sweet and sour, because that’s what it reminds me of. I’ve adapted the sauce recipe a bit more to my liking as I like a sauce (lots of sauce) with bold flavors. Definitely a family favorite and makes great leftovers! You can serve these meatballs over rice or egg noodles. Meat: Mix meat through celery flakes together. Sauce: Combine vinegar through raisins and pineapple in a large pot. Roll meat mixture into walnut sized meatballs and place them in the pot. Cover and simmer for 1 hour in the sauce.